What does it take to be happy? IS there such a thing as true and lasting happiness? And if there is, why do so many of us find happiness so difficult to attain? Our ONLY motivation in life is to be happy. This revelation started Daniel on a journey of spiritual transformation that eventually led him to write his book The Magnificent Truths of Our Existence: Unlocking the Deeper Reality of Permanent Happiness. Neither a lofty, flowery book of pop-spirituality, nor a complex, intellectual philosophical treatise, The Magnificent Truths of Our Existence offers a revolutionary, new perspective for rational people looking for simple, clear and logical explanations for life’s most elusive mysteries. Filled with dozens of practical exercises, this book will show you how embracing your own innocence will unlock the doorway to freedom, self-love, true spirituality and total peace. that will finally help you make SENSE of the Universe. Hailed as the ‘first lady of emerging technologies,’ Dr. Kaur predicts significant advancements that will affect consumers and retailers alike. Dr. Satwant Kaur gave the keynote address at the 2014 IT Expo in Miami in January, and it’s no wonder: her many awards and accolades show that her accomplishments in the field of technology are unparalleled. Though some of her ideas about our near future sound like something out of science fiction, her authority in these matters is unquestionable; truly, with the aid of technology humans will experience a truly fantastic future. Many of Dr. Kaur’s predictions concern the medical industry, or changes in our transit systems and habits; however, recently she has shared ideas that, should they come to fruition, will soon change our everyday lives as we know it. Dr. Kaur believes that in the near future, credit cards will be totally obsolete. The magnetic strip is highly inconvenient for customers, most of whom carry smartphones. Why bother with insecure credit cards when digital wallet payments are an option? It’s true, credit cards are not necessarily the safest way to make purchases. For one, their authorization doesn’t specify the amount of the transaction, meaning that a customer can be charged twice by a merchant, whether accidentally or on purpose. Also, the card itself, or its information, can be easily stolen. Encrpyted digital wallets are the way of the future, insists Dr. Kaur. These wallets will be accessible anywhere through secure smartphone apps, and will authorize payments for specific amounts. Retailers may make them easier to use by installing proximity sensors in checkout registers. While change sometimes comes slowly, Dr. Kaur is confident that consumers will drive all businesses, no matter the size, to change over to these more advanced payment systems. Both customers and business partners will create the expectation that payments should be sent and received in a secure and convenient manner. Dr. Kaur believes that the advancements in digital wallets will allow all parties to spend and earn in a safer, easier manner. Dr. Satwant Kaur, First Lady of Emerging Technologies® in all communications including all electronic, broadcast, and print media formats. Dr. Satwant Kaur is not endorsed by any third-party affiliation, organization, or employer and all opinions are solely of Dr. Kaur's, and do not reflect the opinions and/or views of any third-party affiliation, organization, or employer. For further information, please refer to her web site www.satwantkaur.com. Dr. Satwant Kaur may be contacted at her email Satwant.Kaur@gmail.com." In William McNally’s ‘The Knights of Moonshine’, three friends go on a hunting trip that takes an unexpected turn and lands them in a strange and dangerous world they never knew existed. A pickup truck, ammunition, and plenty of liquor: it was shaping up to be a normal weekend hunting trip for the three town losers. However, what Dennis (the washed up former athlete), Ernie (the good-hearted, dumb one), and Harley (the drunken wildcard) don’t know is that their lives are about to change forever. 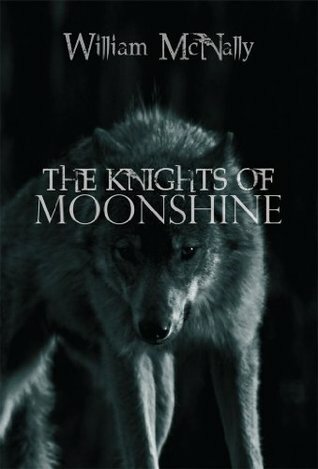 In William McNally’s The Knights of Moonshine, all it takes is a wolf bite to rock the lives of three ne’er-do-wells and introduce them to a dangerous reality they never knew existed. Dennis, Ernie, and Harley spend all their weekends in much the same way, whiling away the time at a remote hunting lodge, getting wasted, and perhaps getting some hunting done (but more likely shooting at road signs). When the liquor runs out, they’ll make their way back to town with little to no memory of the previous couple days. However, when out-of-control Harley performs a crazy stunt, he gets far more than he bargained for and the group will find their lives turned around for good. There’s a world lurking just out of sight, and its strange inhabitants include immortal biker gangs and a threat even more frightening than a dysfunctional clan of werewolves. As the three friends become more intimate will all the dangers of the forest, they are forced to choose between the world they’ve always known, where they’re seen as outcasts, and the crazy new reality that feels strangely like home. Harley’s drunken antics make it clear that seemingly insignificant events can be weighted with fate as William McNally spins his tale of three losers who find an unlikely place in the world. The Knights of Moonshine is a dark and absorbing story about the allure of having somewhere to call home, no matter what the cost. After a career as an executive, William McNally now lives with his wife in the mountains surrounding Dahlonega, Georgia. His first two books, Four Corners Dark and Beneath the Veil were inspired by his interest in dark and thought-provoking tales. The Knights of Moonshine, however, grew out of a visit to an eerie motorcycle shop in a remote area. McNally, who found himself surrounded by a veritable museum of odd pieces of motorized history, was left wondering about the shop's customers and any secrets they might hide and used his musings for the foundation of the book. For more information, please visit http://williammcnallybooks.com/. Wentworth M. Johnson brings Bill Reyner back with ‘Magnuscarter,’ the ninth novel in his Bill Reyner Mystery Adventures series. William Reyner is a private detective with a good deal of experience uncovering nefarious plots. Like a bloodhound, he can sniff out discord with the mere sense that something is afoot. So, when he discovers a mysterious institute operating in total secret in a remote area of Canada, Reyner decides to stop at nothing until the mystery is solved. However, in Magnuscarter, Wentworth M. Johnson’s new addition to his Bill Reyner Mystery Adventures series, Bill Reyner may be getting into more trouble than ever before. To say Bill Reyner is getting into trouble is no surprise. After all, he’s uncovered the truth behind many mysterious murders, helped an associate who was being framed, and accomplished a series of narrow escapes, always putting himself in the line of danger. The secret institute in Canada captures his attention, taking him into hostile territory the likes of which he’s never encountered. Despite the pain and heartache some of his other cases have caused him, Bill Reyner investigates, hot on the trail of the next clue. The deeper he gets into this problem, the more terrible things get. Bill Reyner continues his hunt as bodies pile up and the situation gets increasingly dire. Awkward questions need answering, and the institute’s secrets prove to be worse than murder. All the while, Bill Reyner is searching in a seemingly dead-end quest for King John’s lost treasure. Bill Reyner’s adventure begins as a simple treasure hunt and quickly spirals into one of his greatest mysteries yet. Wentworth M. Johnson surely satisfies readers with Magnuscarter, yet another thrilling page-turner in the Bill Reyner Mystery Adventures series. For more information, please visit http://wentworth-m-johnson.com/. Read Wentworth Johnson's blog at http://wentworth-m-johnson.com/blog/.